I did Driveway Butte many years ago with Lookout Bob and Lookout Sue. 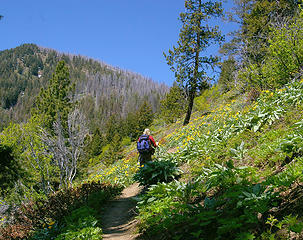 I recall it being steep, draped with lush grasses, and idyllic meadows. This is all still very true of Driveway Butte. 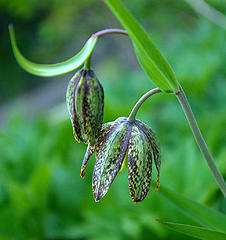 Pretty, flowered slopes, full of balsamroot, desert parsley, and one slope absolutely covered with chocolate lillies! 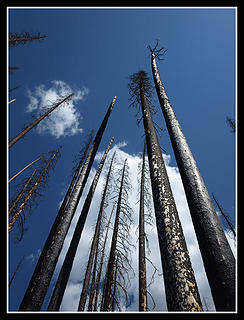 But the 2003 Needles Fire changed it a little. For one, without all those trees clogging it up, the views are way better. 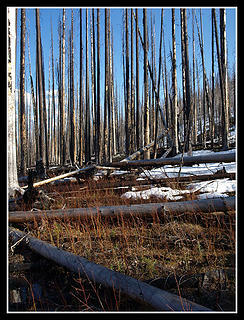 Second, the burned forest is its own special place that wasn’t there before. 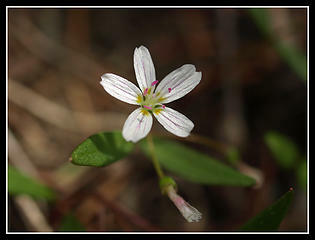 It was certainly special before – full of birds and critters. It’s much quieter now – some birds, and rather than a whispering wind through the pines, the wind whistles and whooshes. Though we left Seattle at 6:15 AM, we still got a late start for Driveway Butte. However, there was a welcomed cool breeze that lasted all day. The trail switchbacks more than I remember it switchbacking. I know there’s a new trailhead – I suspect re-routes created these switchbacks, but I really don’t recall how it was when I first hiked it except as noted above. 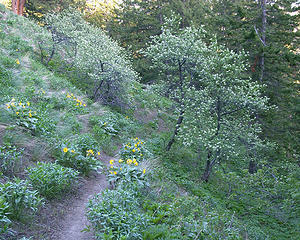 Lots and lots of balsamroot and parsley in bloom now – and acres of silvercrown getting ready to bloom – I am going back to this area next weekend to do some trailwork, and I plan on hiking this lower portion of Driveway Butte solely to see the spectacle that it must be when myriad of silver crown is in bloom (clusters of yellow daisy-like flowers on tall stalks). We met a couple who did not make the summit. The woman told great tales of a massive mud hole so big that they sunk to their knees. They were beaten back. I did not notice muddy boots or knees, but I didn’t want to be rude or anything, so I didn’t look too hard. However, the thought of a mudhole big enough to turn back some hearty-looking hikers was intriguing. 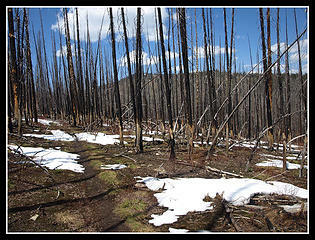 Once the trail hits the Pass at Delancy Ridge, you enter the edge of the Needles fire. The trail dips down a little, and hits some wet marshy areas. Here we met another couple who said a huge muddy pit turned them back. They chose instead to take a trail to summit an unnamed peak to the right of the pass. Now we were really interested in this mud pit. So far, it turned back 100% of the hikers were had met this day. Like any other red-blooded American, we were each drawn toward the mud pit. When one hears tales of a mudpit deep enough to turn people back from a surely gorgeous summit, one must see said mudpit. You can’t just let something like that go. Onward we walked, in search of mud. 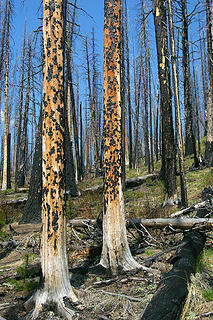 The burned snags here are silvery/orange/black, and through them you can see the mountains. There are willow shrubs growing, currently their new growth adds a pretty red haze as a bottom layer of the forest. We walked through some mudholes, but nothing of note. We kept on, visions of a vast sea of mud in our minds. We soon hit solid snow. Postholing wasn’t too irritating, but I would imagine that by this writing it is quite irritating, and fairly ankle-twisting as the snowbridges collapse over the shallow intermittent creeklets. 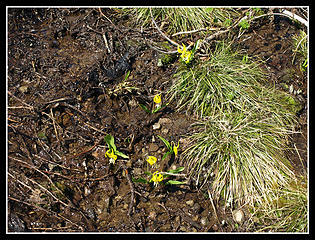 We came to another Pass, mostly snow-free, and chock-full of yellow glacier lilies very, very beautiful. Driveway Butte itself was mostly spared by the fire. 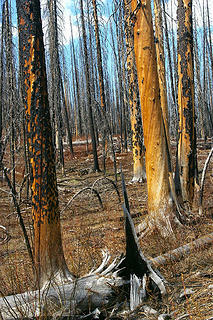 The western portion was burned, but the eastern slope is cloaked in green grasses. We enjoyed some time on the summit, resting, drinking water and eating. Such a beautiful place. When I was here last, I took a photo of my friends lazing on a slope, half obscured by the lush grasses. 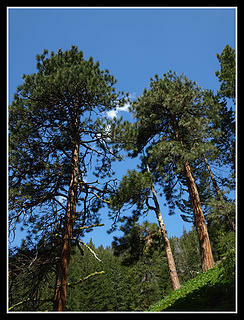 I took another photo of the trail as it leaves the summit and enters the forest – idyllic, fairy-tale. This is that spot. I will try to find the other photos and scan them for comparison, but it won’t be til later this week. Please check back to see them! Thanks to JimK for joining me for this trip – I have wanted to visit this beautiful place again. Of note: I called the Winthrop RD of Okanogan-Wenatchee NF, and asked about the brown shrubbery that appear to be dying in the area from Washington Pass to Winthrop. The lady there was very knowledgable, and said that the buck brush, or snowbrush, is not dying afterall. The snow came a little late, and the bushes froze. Usually the snow insulates them, but not this year. So when you notice a brown shrubbery that looks like it’s dying, know that it is not. We never saw the fabled massive mudhole. I guess being 206'ers, we just weren't adversely affected by anything we confronted. I have not been up there yet this year but there is one spot that often has some nasty mud in the saddle. I discovered in that area that by bearing more to the right there is a solid bottom and to the left you can really sink into a silted in area. But, still only the difference of ankle to maybe mid calf depth. The switchbacks have not changed since at least 1998. They get real hot anytime after June so if planning a summer trip here start early. 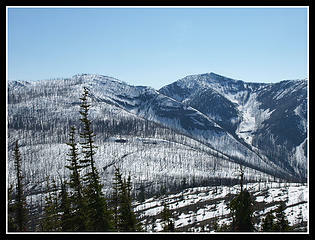 If you peeked down to the north from the summit you might have seen my place below in the Lost River Canyon opening. 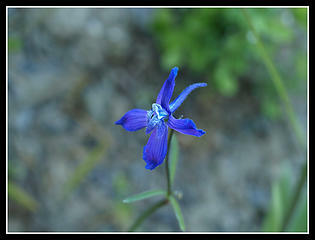 We fully planned to drop by - we also visited Monument Cr & Methow Rv trails and saw your place. But it was too late at the end of the day - we were camed on the Chewuch and had to fire up a fire to cook salmon & steak, so time was of the essence. Yesterday we got caught up in another gorgeous place and simply didn't want to leave. So we didn't, til we had to - making it yet again too late to visit. 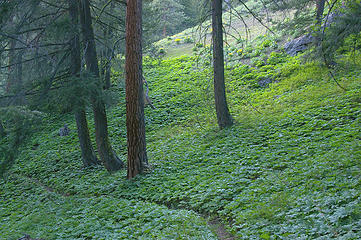 However, I'm doing trailwork on Early W & Wolf Cr trails next weekend and can drop in on your guys. I have not been up there yet this year but there is one spot that often has some nasty mud in the saddle. typical non-206'er flap. T'was a mere puddle to us. Come on by if you have time. We will hang out the Texas flag. Well.....just don't take no pictures of me anywhere near that flag, unless I'm giving it a Spike Jones salute.
. . . or, the locals just gave your chain a really, really good yank!!!! s.d. Well, we think alike. I was there on Sunday after a recommendation to go there. 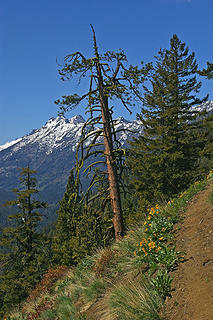 Loved how the trail is out in the open for a lot of it, and great views of Silver Star Mountain. What's your area code - did you find the mudhole? Funny you say that, the four people that came down talked a lot about mud, just like the people you saw!! We did not get to experience that, but that was because we went to the unnamed viewpoint instead since we didn't even start hiking until 2PM and we also had a little baby with us. It was broad flat butte with great views. Sorry, Quark. I don't buy it. 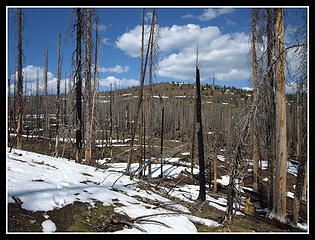 The first few pictures looked great, but the Snow Lake Trail did to me on the "beauties" of fire-ravaged wilderness. I ain't goin' there. Something lost behind the ranges. Lost and waiting for you....... Go and find it. Go! Yeahbut Scrooge, on Snow Lakes trail, coming down, it's usually hotter'n hell, and you're switchbacking switchbacking switchbacking endlessly, all the while looking at your car in the parking lot far below, knowing there's an ice chest in the trunk containing an ice-cold brewski or cherry juice or something. That's the torture of Snow Lakes. These other trails I wrote about this week - Driveway Butte, Methow, and Chewuch - they have wonderful qualities from the get-go. And no views of the parking lot. Quark, you got the Snow Lake description spot on. The only thing I couldn't figure was all these people I met coming up. I mean it was 90 @#$%!ng degrees! Looks like a nice place. Another one to add to my list. Where to go on Memorial Day weekend? Sunny weather for all three days? That never happens. 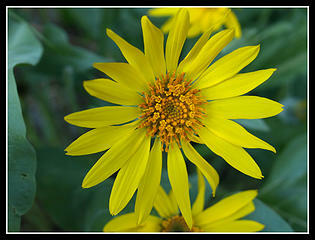 Kim and I chose to head north and east to the Methow Valley. We let the crowds jam the highways on Friday and headed out at 6:00 am on Saturday. Traffic was not bad at all. 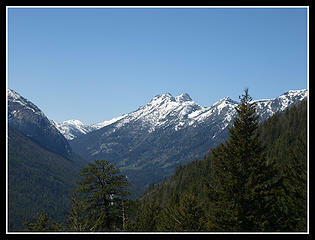 We cruised over the North Cascades Highway and down into the Methow Valley. 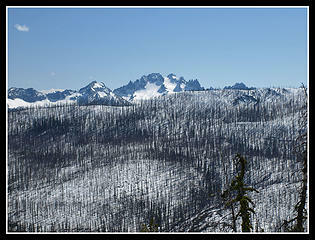 Still lots of snow near Washington Pass making for some great views. We decided to go for Driveway Butte that day. The trailhead is next to Klipchuck campgrounds. It's 12.6 miles east of Washington Pass. There were still two open campsites but we chose to take our chances up the Chewuch River as we planned to hike up there too. It was already 10:50 and getting warm when we started up the trail. Kim had done the trail once before without snow and with trees. A fire burned up the second half of the route. It would be interesting for her to compare forest to burn. The maps show this trail being 4 miles each way. They also show the trail going straight up with on switchback to the right. I believe some rerouting has lengthened the trail. There are now several switchbacks. One is very long. The flower show was excellent. 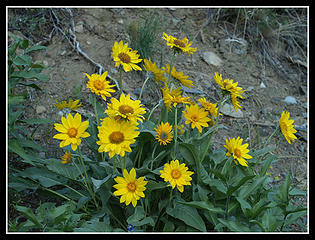 Balsamroot began immediately and continued all the way up the south slope to the burn. 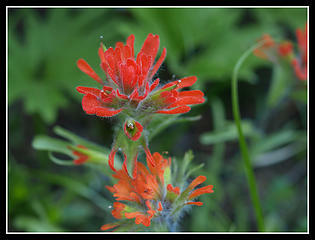 We also saw lots of paintbrush, larkspur, waterleaf, and others. One open slope was covered in desert parsley. Much better flowers than I was expecting. While traversing to the right I heard the sound of a grouse. 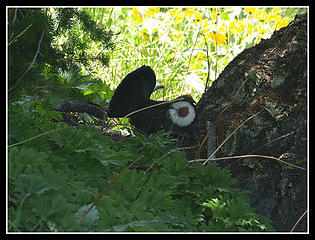 A quick look around showed a male grouse making the racket. He was not going anywhere so we had time to chance to telephoto lenses without him leaving. It was getting hot. Fortunately there was an intermittent cool breeze. As we rose above the forest views began and kept getting better. 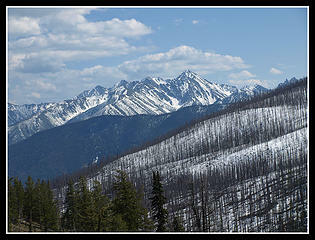 We could see back towards Washington Pass and to big peaks to the south. At the end of the long switchback we stopped for lunch. After a steep start most of the trail is pretty gently graded. Steep enough to gain over 3000' but smooth and steady. 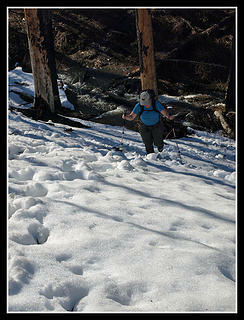 We could see a low spot in Delancy Ridge and the trail was aiming for it. As we neared this saddle we entered the burn area. 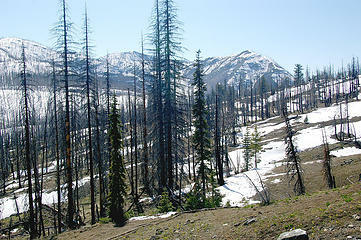 Kim mentioned that the Needles Fire in 2003 burned up the second half of the hike. Before the pass we met a couple who turned around after knee deep mud covered the trail. I reached a junction first. Another couple came down who mentioned the killer mud. They went up the trail to the right which goes to a higher bump on the ridge. Kim caught up and we headed out to see the mud. Hiking in Western Washington we were intrigued to see what could be as bad as what we usually see. Well, the trail was a creek for about 20 feet. A little mud. What a let down. 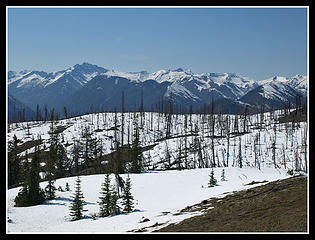 As we contoured around the north side of Delancy Ridge the snow began. First a few patches then more consistent. It was not well past noon and the snow was getting soft. I had many postholes but most were no more than knee deep. My knee deep was a bit deeper for Kim. There were a few footprints and I was able to keep on route. We continued at a pretty level grade crossing a number of small seasonal creeks. The only problems were suspect snow bridges over a few. They held my weight though I had my doubts. We met a group coming out who did summit Driveway. They confirmed the route that seemed most obvious. We turned to the north and the snow dissipated. 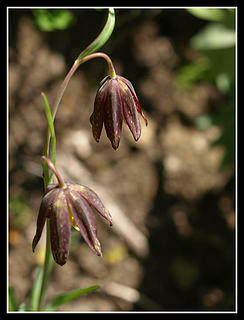 In its place we found lots of glacier lilies and spring beauty. A bootpath does go all the way to the summit though it is not obvious in a few places. The last 450' is steeper and back on a hot south slope. 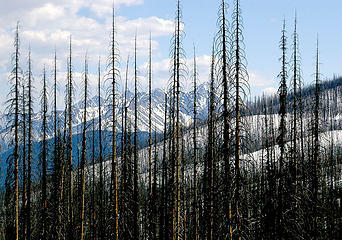 Those sparse trees on the butte escaped the fire. A little shade was appreciated. I reached the summit a few minutes ahead of Kim. 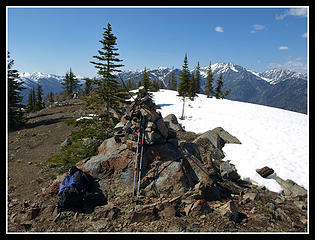 There is a rock summit cairn and the old lookout's corner posts are still there. Not much else. Views are outstanding. We added all the peaks to the north to those we had been enjoying earlier. The wind was really cold on top. Earlier I was sweating up a storm and now it was time for a coat. The trip down was a bit quicker though the snow was even softer. We did run into several late afternoon groups. They were not going to summit until at least 6:00. We drove down to Winthrop then up the West Chewuch Road. Campsites - all full. Off road sites - all full. We kept driving and found nothing at all. After dark it was even a little tougher. Twenty miles up the road and still nothing. Finally we found a side road blocked only about 50' from the road. Beggars can't be choosers. We took it. We set up camp in the dark then started cooking dinner. It was 11:30 when we went to bed. We definitely milked every moment out of the day.